The subject of bond trading is not very popular in many parts of the world, and when you now add this to the concept of trading bonds as binary options, many retail traders will get very confused. Bonds are simply debt instruments used by governments and large corporations to borrow money from the public. Sometimes, governments or large corporations are unwilling to go borrowing money from financial institutions at exorbitant interest rates. Bonds therefore present a low cost form of borrowing for these institutions. Bonds also present an avenue for those who purchase the bond instrument to make money on the fixed percentages that are paid by the borrower (the government or large corporation). 1) Investment – The bond buyer can decide to wait for the tenor of the bond to expire so he can get paid interest on it, in addition to getting his capital back. 2) Speculation – Bond prices are subject to market speculation. 3) Traders can earn money on the changes in the bond yields (the interest to be paid) by buying and selling bonds to other market participants. Bonds are usually rated by credit ratings agencies such as Moody and Fitch in order for bond buyers and traders to assess their value before buying. Federal Government bonds usually carry the highest ratings, followed by state bonds, municipal bonds and corporate bonds, in that order. As a rule, the shorter the maturity of the bond the lesser the interest yield. This is due to lesser uncertainty of short term bonds as opposed to their long term counterparts. Our focus here is how to trade bonds on the binary options markets. 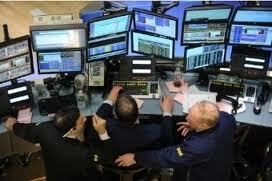 Only very few brokers such as Optionsfair offer bond binary options. a) Interest rates: There is an inverse relationship between bonds and interest rates. Interest rates are themselves affected by economic considerations, which cause the central banks to adopt a suitable interest rate regime. b) Credit rating of Issuers: The issuer financial status determines the credit spread, which is the difference between the yield of the issuer’s bonds against a risk-free bond like that of the US government. Credit spreads are higher for poor quality bond issuers, or bonds with longer maturity. Greek bonds are presently rated as junk due to the dire financial state of the country; credit spreads are large at the moment. c) Bond Maturity: Longer maturity bonds attract higher yields. d) Economic data such as employment reports. e) Political and economic events; the Eurozone is a strong example. f) Extreme variations in stock market prices. Whenever these factors are altered, bond prices fluctuate presenting trading opportunities in the binary options market. To trade bonds effectively on the binary options markets, you need to have a firm grasp of market fundamentals. There is very little place for technical analysis here, especially with the events that have been playing out in Greece, Spain, Portugal, Italy and Ireland in the past 2 years. Bloomberg TV and CNBC stations will be your very best friends here as well, as bond yields are always in the news. By the time you thoroughly understand the relationship between the fundamental factors listed above and the bond prices/yields, you can make solid trade calls with a great degree of accuracy. The Rise/Fall as well as Touch/No Touch options will work very well here.